From robotics to jazz performance, Sam Rainey (E 2021) is making the most of his time at CMU — and is grateful for the support that has made it possible. 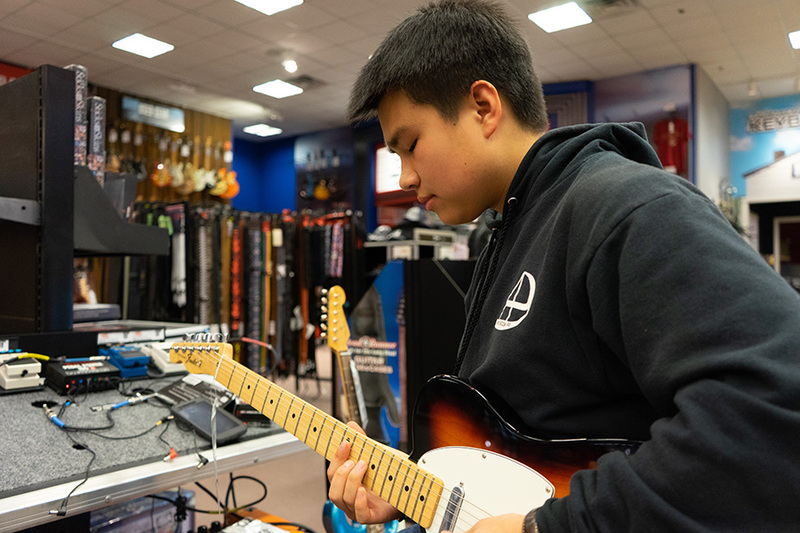 This generous scholarship support has allowed Rainey to combine his passion for music with his academic work in electrical and computer engineering — both inside and outside the classroom. In addition to pursuing his degree, Rainey has designed his own guitar pedals, created musical robots through the Robotics Club’s RobOrchestra project, played guitar for Scotch’n’Soda Theatre and performed with a jazz ensemble in Kresge Theatre. “I have experienced so many ‘firsts,’ grown so much and learned things that can only be learned through a college experience at CMU,” he says. Rainey’s scholarship not only allows him to advance his curiosity and education, but fulfill his family’s dreams for his future. A first-generation college student, Rainey says affordability was a major concern for him and his parents — and that his scholarship opened the door to CMU. Rainey credits his studies with sparking his interest in signal processing, a subfield of engineering that powers innovative technologies like speech recognition, wearables and autonomous driving. “My classroom and lab experiences have opened my eyes to so many possibilities within engineering,” he says. After graduation, Rainey plans to use his CMU education to work on “anything that uses technology to make life better,” from self-driving cars to improving the accuracy of medical devices. Rainey appreciates how Carnegie Mellon encourages creativity and exploration across all disciplines, from STEM to the arts. He has enjoyed learning alongside classmates who come from different backgrounds and have a wide range of interests and talents. You can create life-changing opportunities for CMU students like Sam.